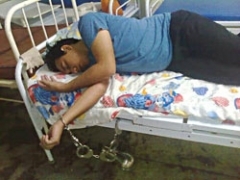 AMAZONAS, Brazil, March 28, 2011 (LifeSiteNews.com) - A Brazilian pastor from the nation’s Amazonas region has become mentally ill following his imprisonment for spanking his two daughters, according to local media reports. Until recently the pastor was reportedly handcuffed to a prison hospital bed, where he was forced even to go to the bathroom in front of staff. Embassies of Brazil to other Nations here. notice the childrens' bedsheets -- his captors are rubbing his face in his "crime"